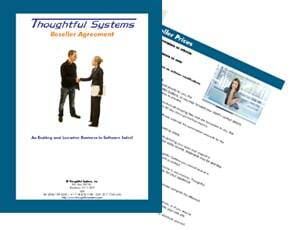 Join Thoughtful Systems in the interesting and lucrative business of service business software sales. We are always looking for partners to assist us with distributing our software all over the world, and with introducing our software to businesses everywhere to assist them with the management of their businesses. Refer prospective customers to us. Forward complete sales to us. Please complete the reseller agreement below and do not hesitate to contact us if you require sales literature to help you market our software products and services.